The Gardens at Gantz is located at 2255 Home Road in Gantz Park. Situated alongside the historic Gantz farmhouse, the gardens provide a unique look at horticulture throughout time. Park staff and volunteers have developed three main gardens to demonstrate a wide range of gardening styles: The Garden of Yesterday, The Garden of Today and the Garden of Tomorrow. Download the Gardens at Gantz Farm, Self-Guided Tour brochure. 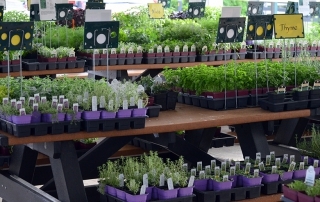 In addition to the herb gardens, the Gardens at Gantz staff members organize educational workshops, an annual herb sale and gardening-related activities. The youth Garden Sprouts gardening group, also meets here. Engraved pavers at the Gardens at Gantz Farm are a unique and thoughtful gift to commemorate special people and occasions. Paver contributions enhance the beauty of the park, and all proceeds benefit future garden improvements. Download the Gardens at Gantz Engraved Paver Program form. Giving a commemorative tree as a gift for a colleague or loved one is a way to help enhance the Grove City community for years to come. The beauty and comfort of a tree has lasting value. Commemorative tree donations will be planted in Fryer Park, Gantz Park, Windsor Park, Henceroth Park and other areas as they develop. Download the Commemorative Tree Donation brochure. The Garden of Yesterday is not a formal garden like some herb gardens of the past, but a kitchen garden typical of an Ohio farm at the time the Gantz farmhouse was built. A farm wife of the 1840’s would have planted herbs together with fruits, vegetables and perhaps some ornamentals in such a garden. This is not a restoration garden. 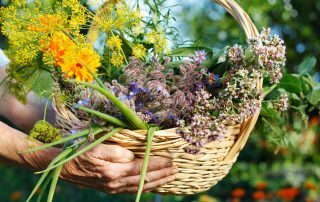 Instead it demonstrates herbs with multiple uses, heirloom vegetables, and old fruit varieties. An herb which was used in cooking, which was thought to have medicinal uses, and which could also be used to dye fabric was desired over plants with single uses. The vegetables are primarily those which were preserved or stored for winter use. The garden does not reflect the large crops which would be necessary to feed a farm family; instead, a small quantity of a large number of vegetables is grown. Vegetables such as corn, squash, and pumpkins, which require a lot of space, would not have been planted in a kitchen garden. Fences surrounded gardens of this era to keep out farm animals. The garden includes brick and gravel walks which probably would not have been in a farm garden, but makes the garden accessible to the public. As visitors pass into the Garden of Today, forms and materials change. Curving walls and walks made of wire cut brick contrast with the rectangular forms and old brick of the Garden of Yesterday, as well as the quarry tile and rectilinear forms of the Garden of Tomorrow. The Garden of Today has aspects of herb gardens found in many locations in the last half of the 20th century. It is divided into theme gardens which emphasize the uses made of plant products and the relationships between plants. A single herb may have several uses, but it is included in the garden demonstrating its most common use. Some woody plants have herbal uses. These are included in the gardens for several reasons. They provide shade for some herbs which require it, help to visually divide areas, and provide new views as visitors turn each corner of the curving alternate paths in the garden. Herbs in the Garden of Tomorrow are planted, not for the use of their plant products, but for the functions they perform in creating a landscape. They are used for their visual and other sensory effects, to create the landscape of the future. They serve as focal points, as ground covers, and in many other ways landscape plants are used. Many are grown in containers. Forms and materials contrast with the Garden of Today. New brick pavers carry out the red color scheme of the other gardens in a contemporary form. Decks, trellises, and planter boxes made of recycled lumber use the rectangular and triangular shapes of many contemporary landscapes. The garden deck is named The Utzinger Outdoor Classroom in memory of Dr. James D. Utzinger, Ohio State University professor and chairman of the steering committee that conceived the Gardens at Gantz Farm. It was his hope that the gardens be not only a beautiful place to visit, but an educational resource for all visitors. Labyrinths are an ancient meditation tool that have been used throughout the world for more than 4,000 years. Unlike a maze, the circular paths have one entrance point that lead to its center with no dead-ends. The Gantz labyrinth, constructed in 2010, is surrounded by an herbal grove including American Beech, Sweet Bay Magnolia and Sassafras. The classic 11-circuit labyrinth design was first laid on the floor of the Chartres Cathedral in northern France in 1201. The rosette in the center has six petals and is often a stopping point for users to stand, sit or kneel and reflect. The Chartres labyrinth is made up of eleven concentric circles connected by 34 turns, 28 of which are 180° switch-backs. Walking the labyrinth represents a journey to one’s spiritual center and then back into the world. There is no right or wrong way to walk a labyrinth’s path so do what feels natural. Follow your own pace. Lose your way. Pass others and be passed. You may want to stop, especially at the switch-back turns. Sit or lie down, with or without shoes, and stay as long as you’d like. This is intended to be a personal and reflective experience that mimics the twists and turns of life. Whether you’re a veteran gardener or just appreciate the scent of a fragrant herb, you will find something of interest as a Gardens at Gantz volunteer. The volunteers have supported the Gardens at Gantz Farm since 1991 through education, fundraising and charitable efforts in Grove City and nearby communities. This diverse group of men and women comes from across central Ohio to operate as an independent, non-profit organization. Volunteers encourage the interest in and use of herbs, assist with the development and historic preservation of the Gardens at Gantz Farm and have fun along the way. Interested in joining? Download the Gantz Volunteer Brochure for information or call 614-871-6323.